First off, before we begin discussing how Tesla is using double-faced cards on Kaladesh, let's quickly go over how they've been used on Innistrad. 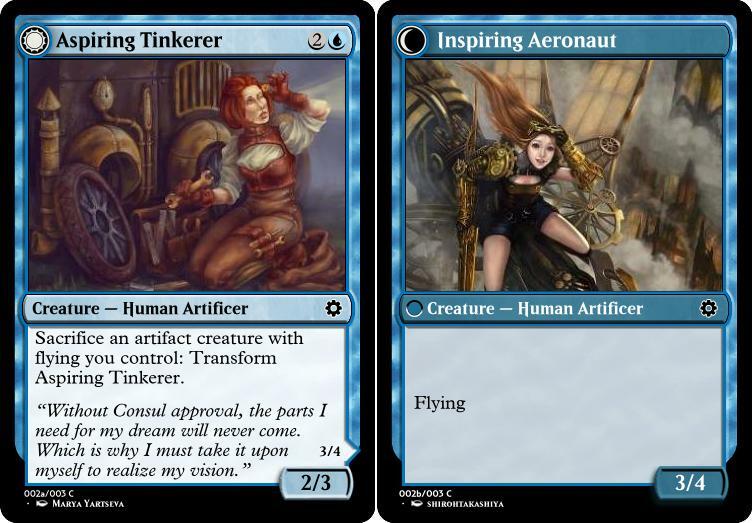 In Innistrad, there were six common DFC's. Four of these are devoted to the werewolf mechanic, but two top-downs made it in as well. Jumping ahead to Shadows over Innistrad, we see that the common DFC landscape has changed considerably. 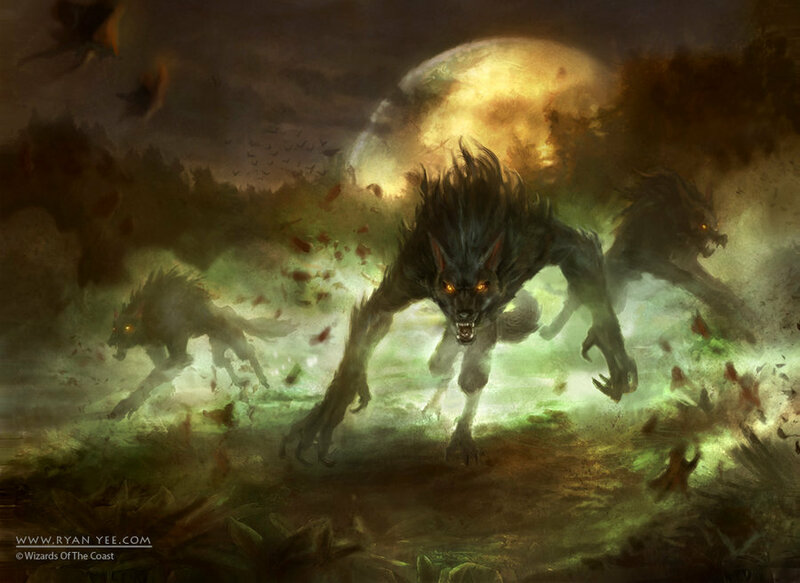 Now, there are four commons, and all of them are werewolves. Lowering the number of common DFCs let them add more uncommon DFCs, which helps produce more variance among the packs. This is a big improvement, and one we'd (ideally) want to follow. Now, with precedence out of the way, let's talk Tesla! 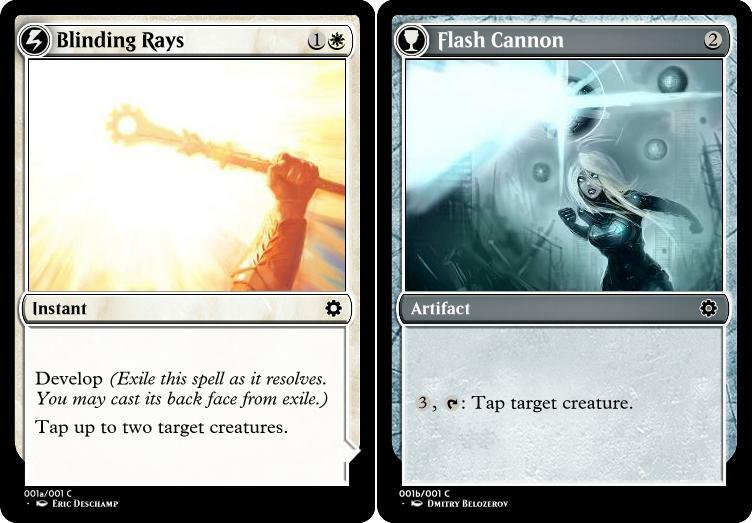 Tesla is the first Magic set to be built around double-faced cards to not have the same atmosphere as Innistrad. Let's leverage this to our advantage, both flavorfully and mechanically. 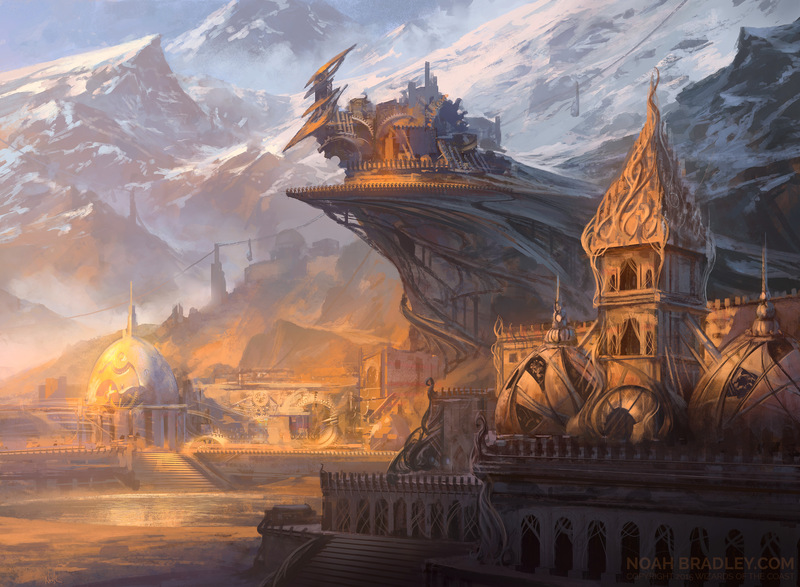 While Innistrad's transformations represent corruption, contamination, and a turning to the darkness, Tesla's transformations represent innovation, improvement, and progress. The most intuitive and simpel way to illustrate this difference is simply to produce a very different feeling of top-down designs, which promote a play experience of inspiration, aspiration, and invention. However, top-down designs can also appear with other mechanics, as well - such as Revolution, one of the flagship mechanics of Tesla so far. While werewolves and Revolution are superficially similar - 'shields-down' mechanics that boost a subset of creatures in the set, all at once, but are usable independently as well - Revolution has a striking difference in its flavor, and plays very differently, so it's both a flavorful and mechanical contrast to Innistrad. On the other hand, Develop (née Discovery) is a big change for double-faced card technology, so it's a huge mechanical contrast, while also being a strong flavorful contrast. While this space was played around with in Shadows of Innistrad (more on that soon), this is still an exciting new development for DFCs. This would be a great way to showcase what makes Tesla different from all other sets with DFCs before it. Though double-faced cards are clearly well-suited to Tesla, using them comes with considerable costs and difficulties. First, there will be an extremely limited number of double-faced cards at common. If we were to shoot for four DFC commons, we'd have to considerably cut down on Revolution designs, and it'd be near-impossible to find a way to have Develop alongside it. Another large issue with double-faced cards is their complexity. 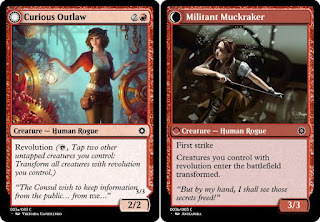 Both Innistrad and Shadows over Innistrad have fewer mechanics which are more simple than normal, and this is not only because the sets are top-down, but also because of the presence of double-faced cards. Tesla currently has Revolution, Justice, Raid, and (possibly) Develop, alongside subthemes of producing Thopters and Canisters. While Thopters are simple enough, Canisters are comparable complexity-wise to Eldrazi Scions, so should probably be considered a mechanic of their own. Overall, this isn't extremely complex, but with the presence of DFCs as well, the complexity count is troublesome. Four Revolution cards and two Develop cards at common. Or, four Revolution and two top-down. "Let's follow Shadows over Innistrad!" 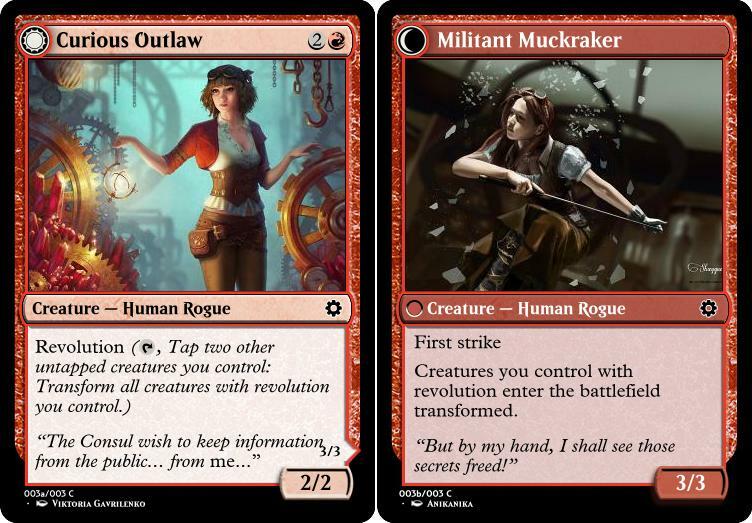 Four Revolution cards, other designs go to uncommon. "Damn Innistrad and Shadows over Innistrad! Let's do this our own way!" With the assumption we've mastered the printing process, we use as many DFC's as we want. We'd have to determine how many at each rarity and in each pack, however. Overall, I personally believe that following Shadows over Innistrad is the best approach available to us. Innistrad had variance issues with its double-faced cards, and trying to do this differently than previous methods will only introduce problems down the road, I fear. And while it might feel bad to not be able to do as many common double-faced designs, it didn't seem to impact Shadows over Innistrad that negatively. In fact, having more at uncommon gives the set more room for more complicated and weird double-faced designs. The big problem with this approach, of course, is that we lose out on the potential of having Develop be present at common. However, we can still have echoes of Develop in the set - maybe not as a keyword, since it wouldn't be present at common, but by using the technology of Startled Awake, it could certainly appear throughout the set at least a few times. Or we could just replace Develop with one of the other mechanics suggested in Kick Into Gear. What do you all think? 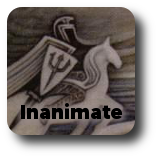 Should we go for the Innistrad method? The Shadows over Innistrad method? Or some new method of your own devising? Please, share your opinions in the comments or on the Tesla Multiverse comments page. I'd say #2, with the point that a keyword doesn't need to appear at common, only a set's theme has to. It is weird to have a keyword not appear at common, though, but I could certainly see only doing Develop at higher rarities. Develop screams "Only do this at higher rarities" to me. The upside of making Develop uncommon is we don't have to make unattractive commons (since they tend toward card advantage). Fuse was a 2-cards-in-1 mechanic and it was not at common. if there is enough room for at least 8 or so develop cards I have no problem with it being a non-common keyword. Yeah, good points, everyone! Consider me swayed. I don't feel Develop raises complexity as much as a standard DFC, because it doesn't have the potential to transform on the battlefield. It's barely more complex than a cantrip.